Winter is officially here in Aomori. It’s gotten really cold lately and we’ve had a few dustings of snow. The weather makes me want to curl up with a good book in the kotatsu (a heated table with a thick blanket cover) and drink warm tea all day. 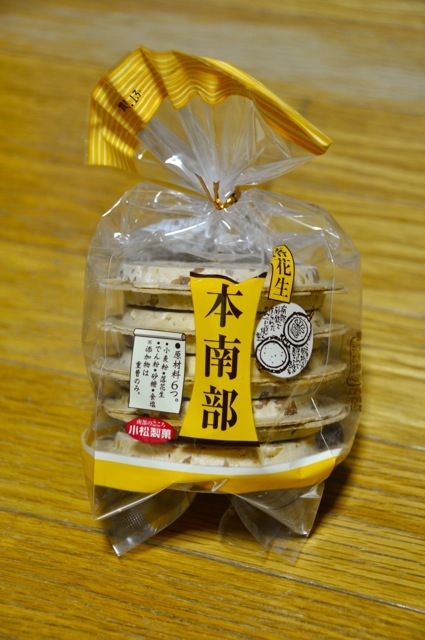 Nambu Sembei (sometimes written as Nanbu Senbei) are a traditional snack in Aomori Prefecture, and in parts of Iwate Prefecture- specifically where they originated, the old Nambu clan areas around what is present-day Hachinohe City. The name Nambu refers to this area, and sembei is a Japanese word for cracker, biscuit, or cookie. 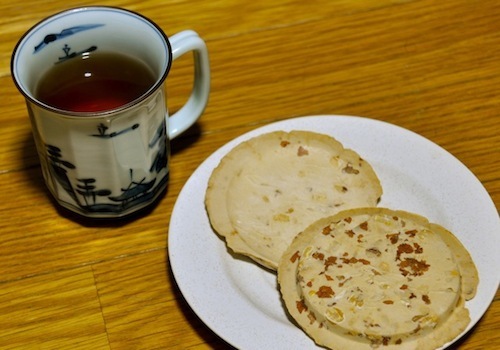 Nambu Sembei, unlike other sweets in Japan, are not made from rice but instead wheat and come in a wide variety of flavors, including apple, pistachio, etc., but the most common types have either sesame seeds or peanuts in them. The peanut flavored ones are my personal favorite. They have a very mild and slightly sweet slightly salty taste, making it a simple yet very Japanese flavor that goes great with tea. As you can see they have a unique saucer shape, with a crispy thin outer rim that is known as the “mimi” (ear). The “mimi” is made when Nambu Sembei are baked in their metal molds over a hot fire. You can see them being made a quite a lot of places throughout Aomori, including Aomori station, and other tourist hotspots. But, another reason why Nambu Sembei are one of my favorite snacks is because you can buy them at almost any convenience store in the area. It’s a little hard to tell from this picture, but Nambu Sembei have a nice picture on the inner side. This brand has uses a pine tree design on their sembei. 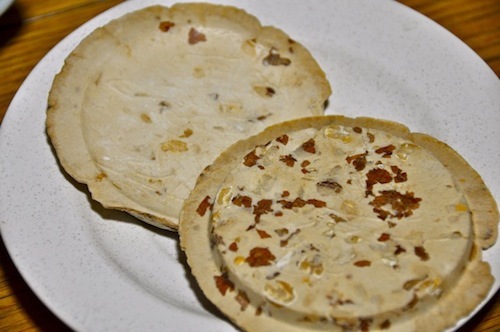 I really like the simple and natural peanut patterns in the sembei too. Nambu Sembei don’t weigh much at all, stay fresh for a long time, and their universal appeal make them an ideal souvenir. However since they are a little brittle they are prone to breaking into pieces so you need to take care when packing them. Some gift shops sell them in a strong collectible tin that will keep them from breaking so I recommend buying Nambu Sembei that come in a tin, especially if you are bringing them a long way for someone special. So if you are trying to find the perfect gift for that certain somebody who has everything, or if you are just looking for a snack while exploring Aomori, try this lovely local speciality, Nambu Sembei.